Nappy sacks – flimsy plastic bags used to dispose of soiled nappies – are a relatively recent phenomena for parents. Parents are advised to never place nappy sacks in a baby’s cot or pram, and to keep them a safe distance away from babies’ and young children’s inquisitive hands at all times. But these sacks have been implicated in causing the suffocation and choking of babies who are less than one year old, prompting a campaign by the Royal Society for the Prevention of Accidents (RoSPA) to warn parents in England and Scotland on the possible dangers. This issue was first brought to light in September 2010 when a baby died from asphyxia due to a nappy sack. Beth Beynon, child accident prevention co-ordinator for NHS Cornwall and Isles of Scilly (NHS CIOS), heard about the case through the local Safeguarding Children Board and was part of the NHS team which immediately set about gathering information to develop an understanding of the circumstances and to identify whether similar deaths had occurred elsewhere. This exercise highlighted that asphyxia from nappy sacks had caused up to 10 known deaths in babies across England and Wales alone. However, none of these cases had come to the attention of national accident prevention bodies, nor had they been logged on the national Trading Standards database. Each area had assumed their incidents were one-off, isolated cases. Sadly, since then two more deaths have been added to the list bringing the total to 12. The typical scenario associated with the deaths involves sacks which are stored within the baby’s reach, close to the baby’s cot – including under the mattress usually for convenience. In some of the cases, the nappy sacks had been left near to or in the cot for ease of changing the baby’s nappy in the night. Babies are at particular risk because despite naturally grasping items and putting them in their mouths, they find it difficult to let go or remove them when in trouble. Once in their mouths, the nappy sack can lead to obstruction of the nose and mouth and prevent babies from inhaling fresh air. The flimsiness of nappy sacks also makes them small enough to fit into little mouths, plus they do not rustle in the same way as plastic bags and can be easily breathed in by babies without parents realising. Informal feedback from parents and carers and professionals demonstrated that the risk to young babies is compounded by the fact that widespread usage of nappy sacks is a relatively recent phenomenon. Parents and carers are generally aware of the dangers posed by plastic bags, but do not make the same link to nappy sacks and so they are less likely to take the same safety precautions. The risk of this potential hazard is increased by the lack of mandatory suffocation warning advice on the packaging and the product’s frequent availability as loose bags in a packet, as opposed to supplied on a roll. Thousands of RoSPA posters and leaflets, warning families of the dangers of leaving plastic nappy sacks lying near babies, are currently being distributed to GP surgeries, parent and toddler groups and other family centres. 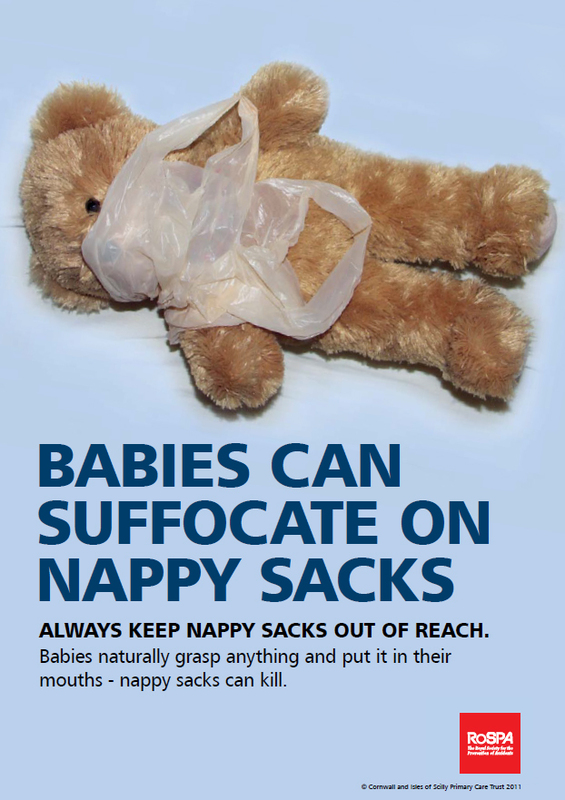 Any organisations involved with children’s services in England and Scotland can apply for these nappy sack safety leaflets by visiting RoSPA’s nappy sack safety advice page.